Home ¿Qué es una corrida de toros? 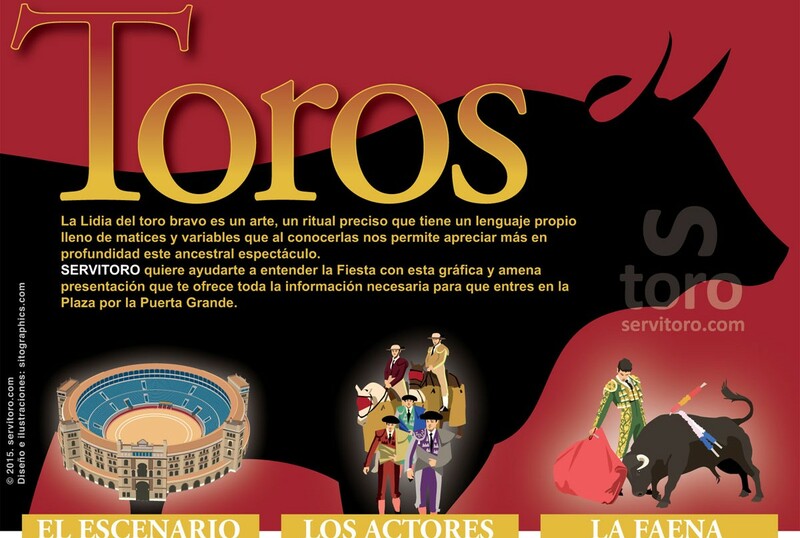 ¿Qué es una corrida de toros? La Lidia del toro bravo es un arte, un ritual preciso que tiene un lenguaje propio, lleno de matices y variables que al conocerlas nos permite apreciar más en profundidad este ancestral espectáculo. Servitoro quiere ayudarle a entender la Fiesta con esta gráfica y amena presentación, que te ofrece toda la información necesaria para que entres en la Plaza por la Puerta Grande. El Escenario, los Actores y la Faena. How much do you now about bulls? Bullfighting is an art and also a ritual. It is has its own jargon and is plentiful of details and variations. Only by knowing and understanding all its particularities would the spectator truly appreciate this ancient show. 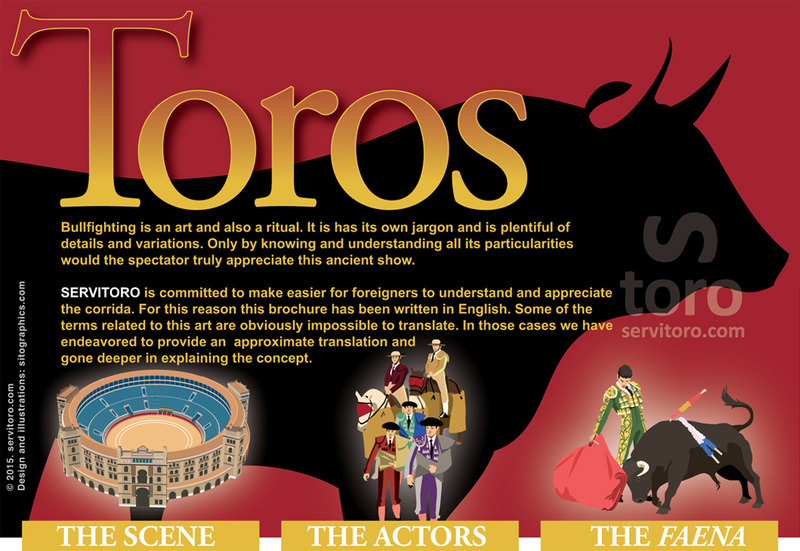 SERVITORO is committed to make easier for foreigners to understand and appreciate the corrida. For this reason this brochure has been written in English. Some of the terms related to this art are obviously impossible to translate. In those cases we have endeavored to provide an approximate translation and gone deeper in explaining the concept. The bullring. 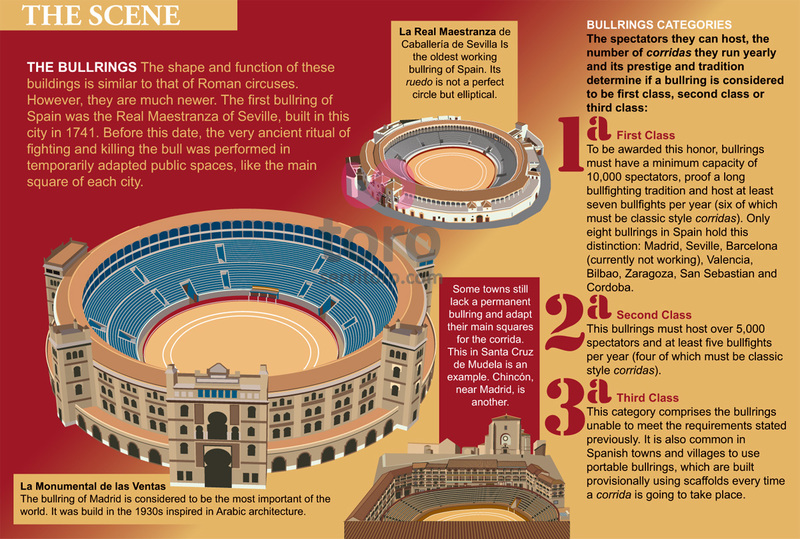 The shape and function of these buildings is similar to that of Roman circuses. However, they are much newer. The first bullring of Spain was the Real Maestranza of Seville, built in this city in 1741. Before this date, the very ancient ritual of fighting and killing the bull was performed in temporarily adapted public spaces, like the main square of each city. The bullring of Madrid is considered to be the most important of the world. It was build in the 1930s inspired in Arabic architecture. Is the oldest working bullring of Spain. Its ruedo is not a perfect circle but elliptical. Some towns still lack a permanent bullring and adapt their main squares for the corrida. This in Santa Cruz de Mudela is an example. Chincón, near Madrid, is another. To be awarded this honor, bullrings must have a minimum capacity of 10,000 spectators, proof a long bullfighting tradition and host at least seven bullfights per year (six of which must be classic style corridas). Only eight bullrings in Spain hold this distinction: Madrid, Seville, Barcelona (currently not working), Valencia, Bilbao, Zaragoza, San Sebastian and Cordoba. This bullrings must host over 5,000 spectators and at least five bullfights per year (four of which must be classic style corridas). This category comprises the bullrings unable to meet the requirements stated previously. It is also common in Spanish towns and villages to use portable bullrings, which are built provisionally using scaffolds every time a corrida is going to take place. Central part of the bullring where the lidia (fight) takes place. The barrera separates it from the rest of the building. its diameter ranges from 60 to 35 meters and it is covered with a special kind of sand called albero. Bullrings are divided in two different sections, sun and shade. Spectators in the first one will receive direct sunlight during the corrida, while those sitting in the second will normally enjoy a cooler temperature. The palco presidencial (presidential balcony) is considered to be the core of the bullring. Next to the presidential balcony the palco real (royal balcony) and/or palco the autoridades (reserved to members or the royal family or VIPs) can be found. 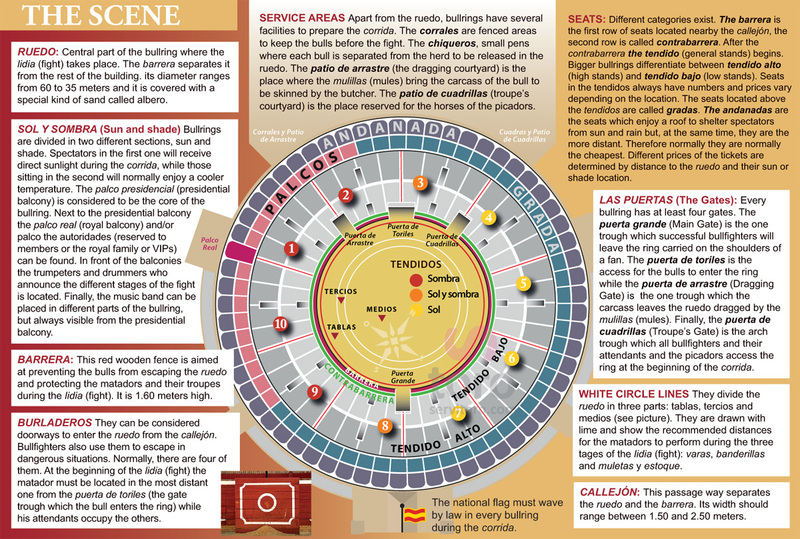 In front of the balconies the reloj de clarineros y timbaleros (clock of trumpeters and drummers who announce the different stages of the fight) is located. Finally, the music band can be placed in different parts of the bullring, but always visible from the presidential balcony. They can be considered doorways to enter the ruedo from the callejón. Bullfighters also use them to escape in dangerous situations. Normally, there are four of them. At the beginning of the lidia (fight) the matador must be located in the most distant one from the puerta de toriles (the gate trough which the bull enters the ring) while his attendants occupy the others. Apart from the ruedo, bullrings have several facilities to prepare the corrida. The corrales are fenced areas to keep the bulls before the fight. The chiqueros, small pens where each bull is separated from the herd to be released in the ruedo. The patio de arrastre (the dragging courtyard) is the place where the mulillas (mules) bring the carcass of the bull to be skinned by the butcher. The patio de cuadrillas (troupe’s courtyard) is the place reserved for the horses of the picadors. Different categories exist. The barrera is the first row of seats located nearby the callejón, the second row is called contrabarrera. After the contrabarrera the tendido (general stands) begins. Bigger bullrings differentiate between tendido alto (high stands) and tendido bajo (low stands). Seats in the tendidos always have numbers and prices vary depending on the location. The seats located above the tendidos are called gradas. The andanadas are the seats which enjoy a roof to shelter spectators from sun and rain but, at the same time, they are the more distant. Therefore normally they are normally the cheapest. Different prices of the tickets are determined by distance to the ruedo and their sun or shade location. Every bullring has at least four gates. The puerta grande (Main Gate) is the one trough which successful bullfighters will leave the ring carried on the shoulders of a fan. 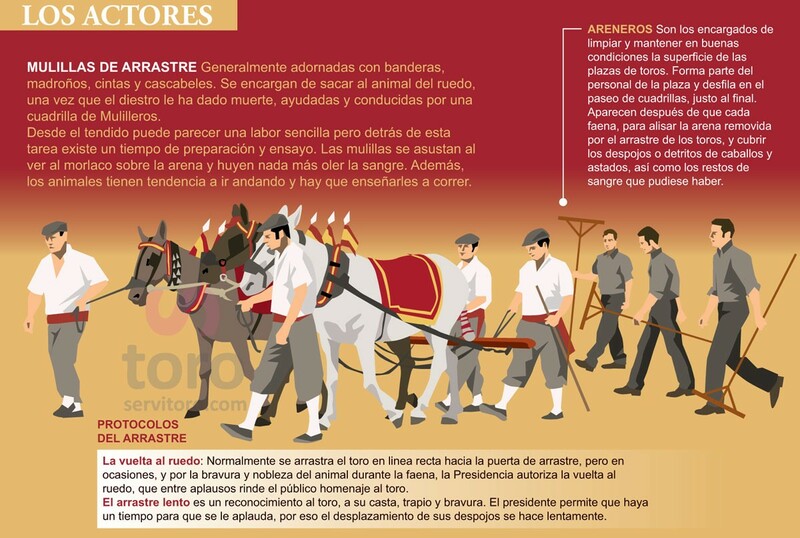 The puerta de toriles is the access for the bulls to enter the ring while the puerta de arrastre (Dragging Gate) is the one trough which the carcass leaves the ruedo dragged by the mulillas (mules). Finally, the puerta de cuadrillas (Troupe’s Gate) is the arch trough which all bullfighters and their attendants and the picadors access the ring at the beginning of the corrida. They divide the ruedo in three parts: tablas, tercios and medios (see picture). 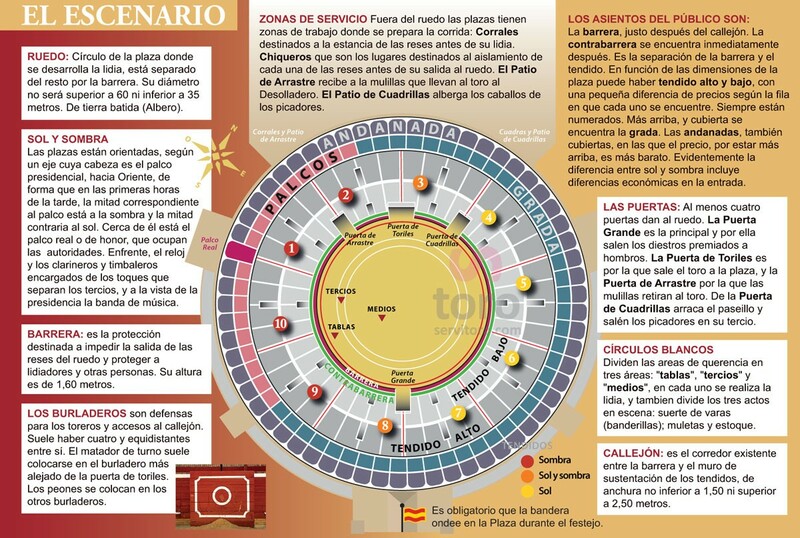 They are drawn with lime and show the recommended distances for the matadors to perform during the three stages of the lidia (fight): varas, banderillas and muletas y estoque. This passage way separates the ruedo and the barrera. Its width should range between 1.50 and 2.50 meters. 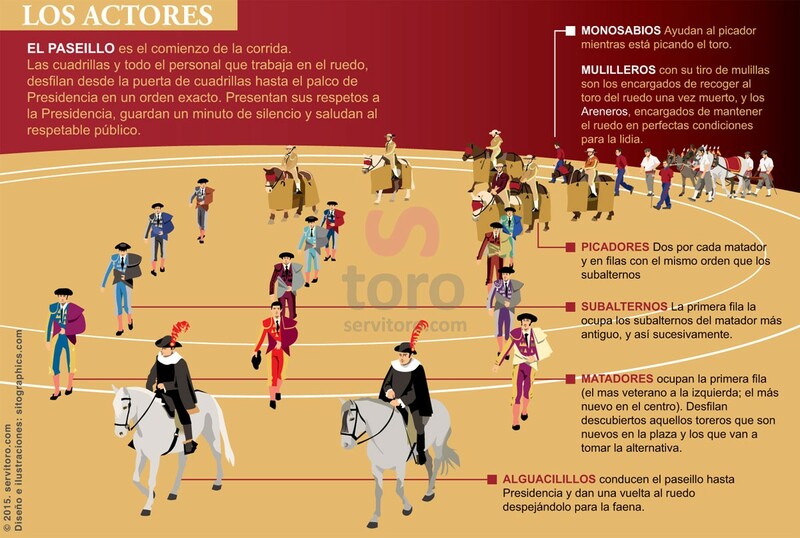 The corrida is divided in three tercios (stages) and two suertes (parts): capote –when the bullfighter uses the capote (cape)- and muleta (a scarlet cloth folded over a wooden stick). The first tercio is called varas (Pikes), the second banderillas (Little Harpoons) and the third muerte (Death). After the second tercio, the matador will switch from the suerte de capote to the suerte de muleta. The beginning time of the corrida will be determined by the intensity of sunlight. In Spain normally corridas begin at 5 pm in March and since then they are systematically postponed until 7 pm, which is the normal beginning time in August. In autumn, they usually begin at 6 pm. The bullring will confirm the time of each show two weeks before. 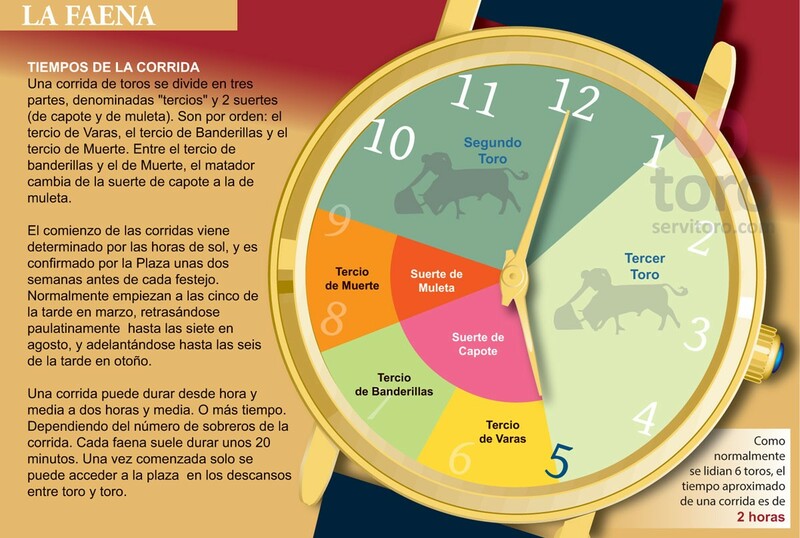 The duration of a normal corrida ranges from one hour and a half to two hours and a half. Exceptionally it can last more than that if the number of sobreros (extra bulls) is unusually large. The average length of a faena (work with one bull) is around 20 minutes. The seats cannot be accessed or left during the faena. Spectators must wait until the break time. Is the beginning of the corrida. Bullfighters, their troupes and all people who work in the bullfight march from the puerta de cuadrillas (Gate of the Troupes) to the palco presidencial (presidential balcony). The order is very strict. Once the parade is finished, the participants wave their hands at the president, wait one minute in silence and then wave at the audience. Matadores (Bullfighters) They occupy the first row in the parade. The oldest one is located on the left side and the youngest in the middle. If a matador is fighting bulls for the first time in that bullring, he will carry his montera (hat) in his hands during the paseíllo. Alguacilillos (Sheriffs) They drive the parade to the presidential balcony and after that they spin around the ruedo on their horses to verify that everything is prepared for the bullfight to begin. 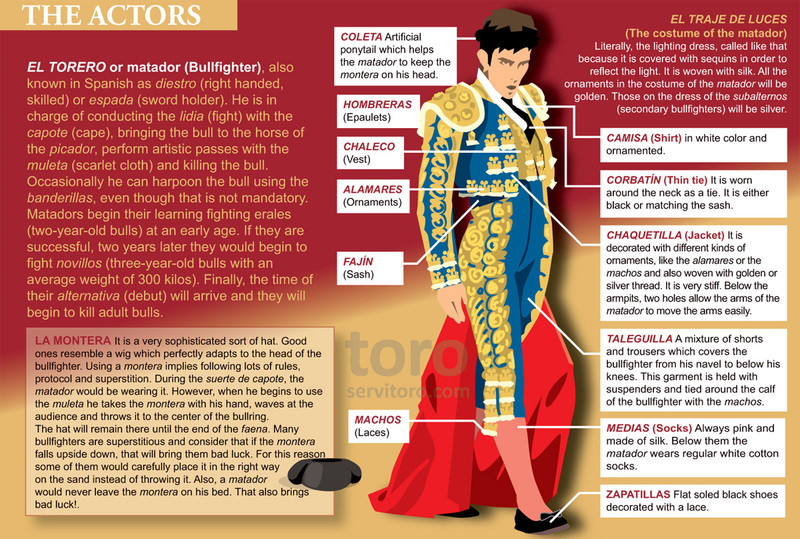 El torero or matador (Bullfighter), also known in Spanish as diestro (right handed, skilled) or espada (sword holder). He is in charge of conducting the lidia (fight) with the capote (cape), bringing the bull to the horse of the picador, perform artistic passes with the muleta (scarlet cloth) and killing the bull. Occasionally he can harpoon the bull using the banderillas, even though that is not mandatory. Matadors begin their learning fighting erales (two-year-old bulls) at an early age. If they are successful, two years later they would begin to fight novillos (three-year-old bulls with an average weight of 300 kilos). Finally, the time of their alternativa (debut) will arrive and they will begin to kill adult bulls. It is a very sophisticated sort of hat. Good ones resemble a wig which perfectly adapts to the head of the bullfighter. Using a montera implies following lots of rules, protocol and superstition. During the suerte de capote, the matador would be wearing it. However, when he begins to use the muleta he takes the montera with his hand, waves at the audience and throws it to the center of the bullring. The hat will remain there until the end of the faena. 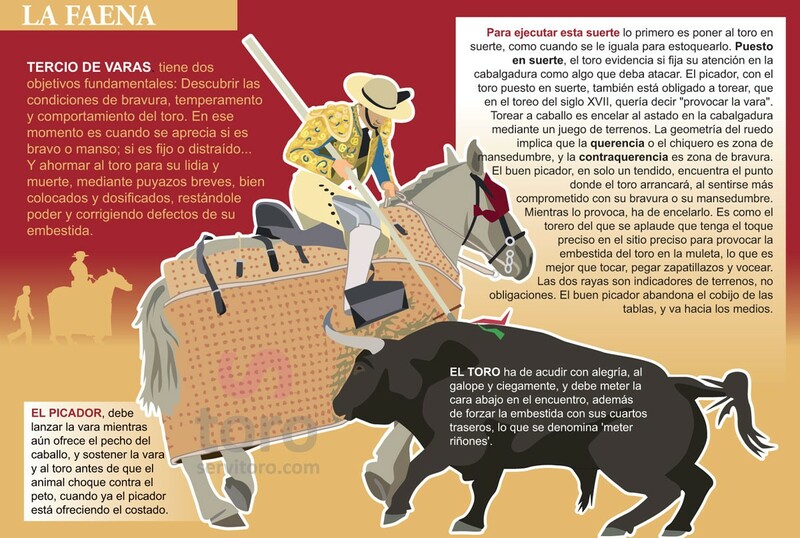 Many bullfighters are superstitious and consider that if the montera falls upside down, that will bring them bad luck. For this reason some of them would carefully place it in the right way on the sand instead of throwing it. Also, a matador would never leave the montera on his bed. That also brings bad luck! Literally, the lighting dress, called like that because it is covered with sequins in order to reflect the light. It is woven with silk. All the ornaments in the costume of the matador will be golden. 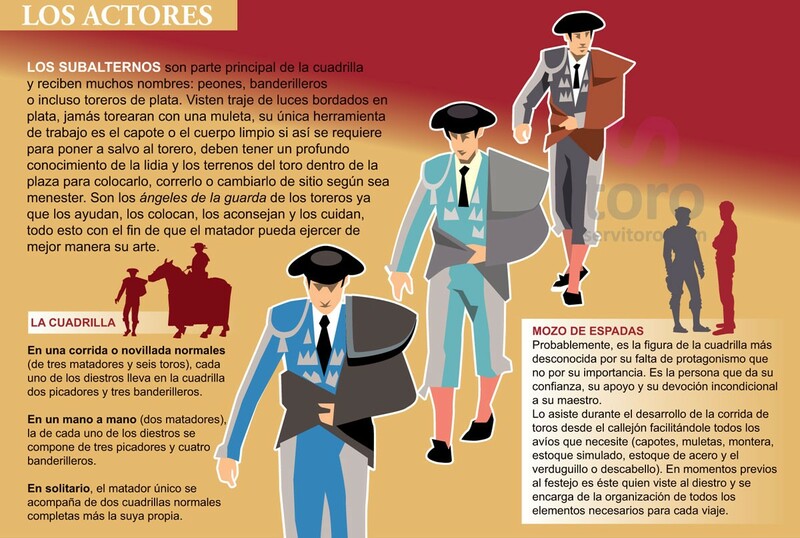 Those on the dress of the subalternos (secondary bullfighters) will be silver. Chaquetilla (Jacket) It is decorated with different kinds of ornaments, like the alamares or the machos and also woven with golden or silver thread. It is very stiff. Below the armpits, two holes allow the arms of the matador to move the arms easily. 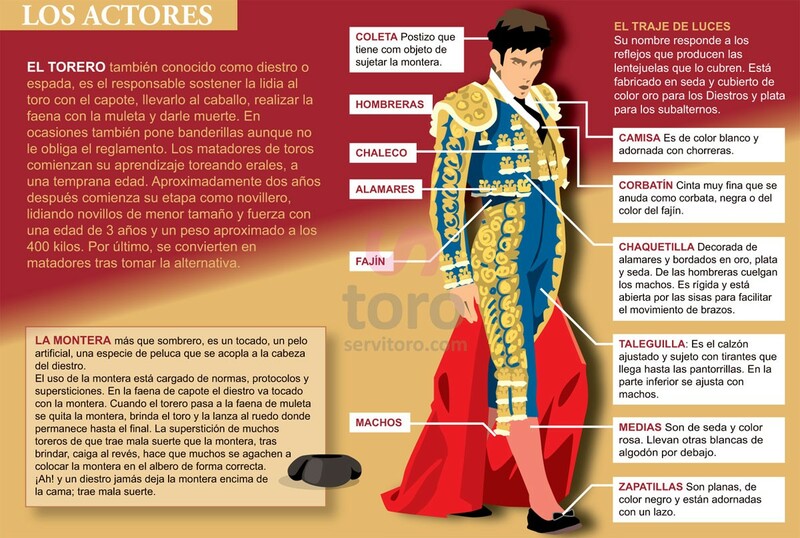 Taleguilla: A mixture of shorts and trousers which covers the bullfighter from his navel to below his knees. This garment is held with suspenders and tied around the calf of the bullfighter with the machos. Medias (Socks): Always pink and made of silk. Below them the matador wears regular white cotton socks. Zapatillas: Flat soled black shoes decorated with a lace. Los subalternos (Secondary Bullfighters) Members of the team or troupe of the matador. 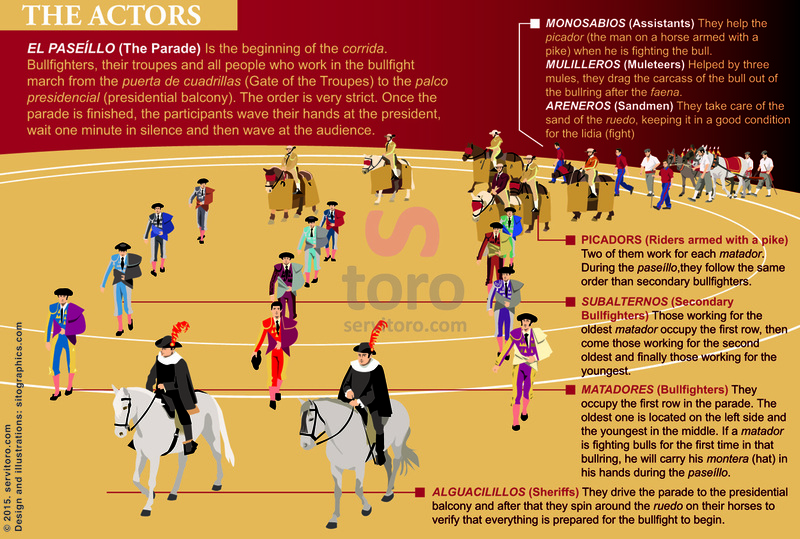 Different names are given to them: peones (laborers), banderilleros, (harpooners) or toreros de plata (bullfighters in silver dress) because of their costume. Bullfighting rules do not allow them to use the muleta (scarlet cloth). 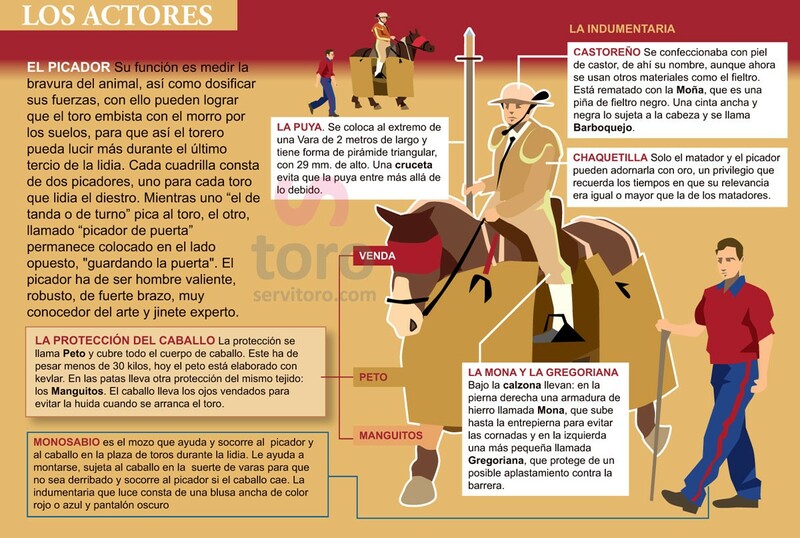 The only tools allowed for them are the capotes (capes) and their bodies with the purpose of granting the safety of the main bullfighter. Many matadors call them guardian angels. A deep knowledge of the lidia and the behavior of the bull is a must for secondary bullfighters. - La cuadrilla: Is the team –or troupe- of the matador. In a normal corrida (those in which six bulls are killed by three matadors) every matador is assisted by two picadors and three secondary bullfighters. - In a mano a mano (a corrida in which only two matadors participate) the cuadrilla needs to be enlarged with an extra subalterno, to reach the four, and an extra picador, to reach three. In a corrida en solitario (with only one matador) the bullfighter needs to be assisted by two more cuadrillas apart from his own. - Mozo de espadas: Probably the most unknown actor of the bullfight, but an important one. He is the one who supports and helps the matador. His role consists in bringing the diestro all the tools he might need during the corrida (swords, cape, muleta, montera, or killing knife) from the callejón. He is also in charge of dressing the matador and organize his trips and those of the cuadrilla. The role of this this armored rider with a pike is to test the courage of the bull. Secondarily he is supposed to wound the animal, so that the bull will be forced to gore with his head close to the ground, thus allowing the matador to eventually kill it. If the work of the picador is well done, the chances of the matador to have a good performance are increased. Every cuadrilla has two picadors. During the corrida, each of them will be in charge of one bull. While the picador de turno (the one wounding the bull at a given moment) works, the other one should be guarding the opposite gate in order to prevent any escape attempt from the bull. Picadors need to be strong courageous men, as well as expert riders and with a deep knowledge of bullfighting. It must cover and protect the whole body of the horse and weight at least 30 kilos. Nowadays it is made of kevlar. The legs of the horse are protected with stripes of the same material called manguitos. Before the corrida, the eyes of the horse are blinded with two patches. Otherwise the animal would be scared of the vicinity of the bull and run away. His role is to assist the picador and the horse during the tercio the varas (fist stage of the fight). He helps him to ride on the horse, pushes while the bull is attacking to prevent rider and horse to fall and helps the picador to stand again if he is lying on the ground. Monosabios always wear a red or blue shirt and dark trousers. 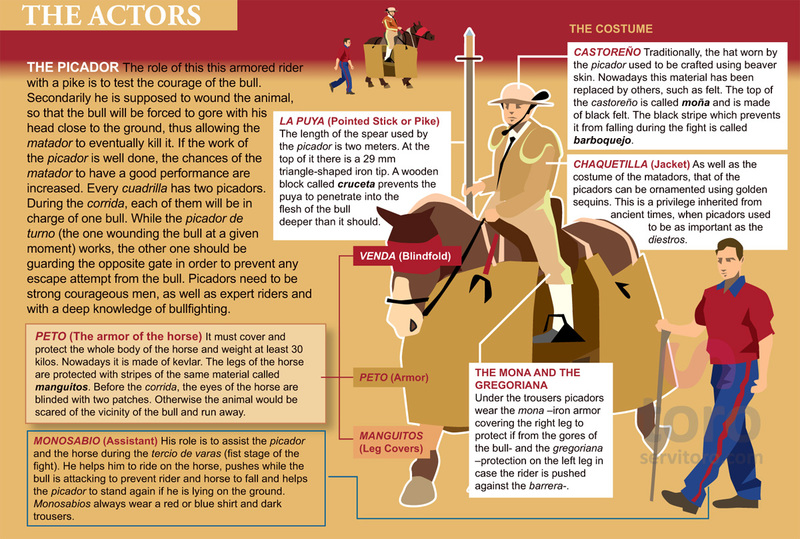 The length of the spear used by the picador is two meters. At the top of it there is a 29 mm triangle-shaped iron tip. A wooden block called cruceta prevents the puya to penetrate into the flesh of the bull deeper than it should. Castoreño: Traditionally, the hat worn by the picador used to be crafted using beaver skin. Nowadays this material has been replaced by others, such as felt. The top of the castoreño is called moña and is made of black felt. The black stripe which prevents it from falling during the fight is called barboquejo. Chaquetilla (Jacket). As well as the costume of the matadors, that of the picadors can be ornamented using golden sequins. This is a privilege inherited from ancient times, when picadors used to be as important as the diestros. Under the trousers picadors wear the mona –iron armor covering the right leg to protect if from the gores of the bull- and the gregoriana –protection on the left leg in case the rider is pushed against the barrera-. Usually they are adorned with flags, pompoms, stripes and sleigh bells. Once the matador has killed the bull, they drag the carcass out of the bullring commanded by a team of mulilleros (muleteers). The duty of this people is not as easy as it might seem. Mules need to be trained beforehand because they are scared of the smell of the blood and the sight of the bull and, therefore, are naturally prone to run away. They also need to be taught how to gallop properly. Vuelta al ruedo: If the bull has shown unusual courage he is awarded to be dragged around the bullring after his death and receive the praise of the audience in the form of claps, instead of being directly pulled off. This honor is awarded by the president. Arrastre lento (Slow Dragging) Another way to greet the death bull for his courage but less important than the vuelta al ruedo. In this case, the carcass of the bull is dragged slowly, so that the audience has the opportunity to clap. They are in charge of keeping the sand that covers the ruedo in good conditions for the bullfight. During the paseíllo, they march together with the matadors and their cuadrilllas, although they are hired by the bullring. After each corrida they flatten the sand of the ruedo, remove tracks of blood, bull pat and horse dung. They are the first actors to appear in the bullring riding their horses. They gallop around the ruedo to make sure everything is ready for the corrida to begin. After receiving permission from the president, they gallop back to the puerta de cuadrillas (Troupes Gate) and march at the front of the participants during the paseíllo. Alguacilillos are the authority in the ruedo. They give the keys of the puerta de toriles (Bullpen Gate) to the torilero –person in charge of opening it. During the fight they stay in the callejón and transmit the commandments of the president to the matadors and their cuadrillas. Additionally at the end of each faena, they are responsible for cutting the ears and tails of the bull awarded by the president to successful bullfighters. 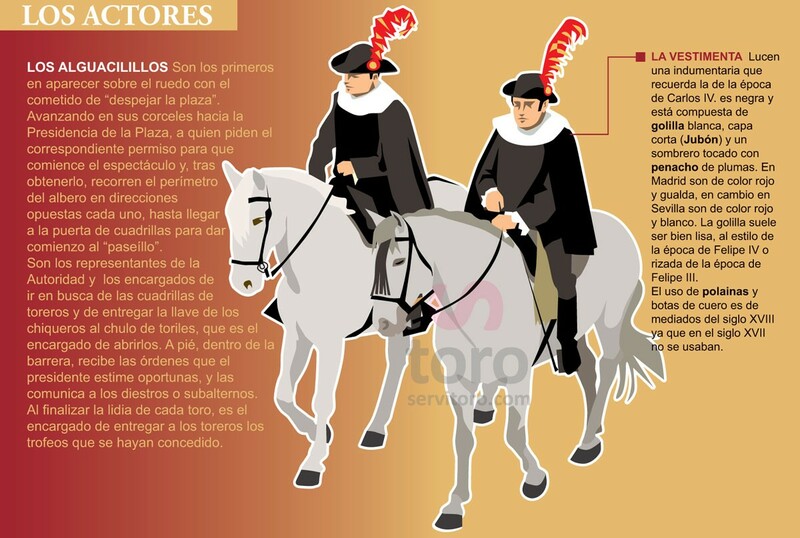 The costume of the alguacilillos is that sheriffs used to wear in Spain during the time of king Charles IV: black clothes, white collar, a short cape (jubón) and a hat decorated with a long plume. The color of the plume varies between bullrings. In Madrid it is yellow and red. In Seville, red and white. The collar can be flat –as in the times of Charles IV-or corrugated –as in times of Philiph III-. Since the XVIII century, alguacilillos also wear leader boots. He is the authority of the bullring. His duty is to interpret and enforce the rules regulating the bullfight. He is the director of the corrida. He determines the timing, he punishes and he gives rewards. Normally he is the representative of the Government in the district or a police officer. His is not an easy job. Frequently, the audience whistles to presidents in order to protest their decisions. 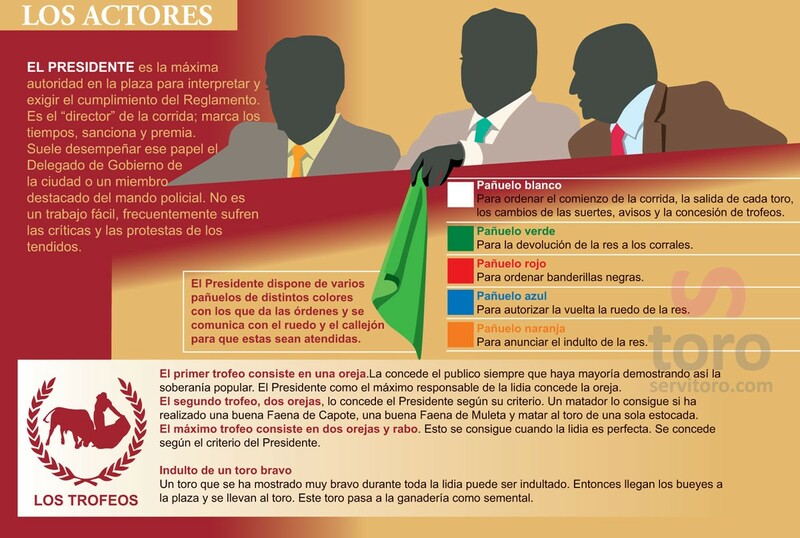 The president has shawls in different colors. He shows them to give orders and transmit them to the ruedo and the callejón. First Trophy: An ear is cut out of the carcass and given to the matador as a recognition of his good performance. The president will award this if the majority of the audience claims for it waving their shawls. Second Trophy:Two ears are cut. The president alone will decide if the performance of the matador deserves this honor. A good performance with the capote and the muleta, as well as killing the bull in a superb way are necessary to receive this distinction. Third (and maximal) Trophy: Two ears and the tail are cut. The lidia must have been perfect. Excellent bulls who have demonstrated superb attributes, courage and strength during the lidia can be pardoned and avoid being killed. A herd of bullocks will enter the ring and drive him out. Pardoned bulls spend the rest of their lives as stallions. According to historians, the current breed is a descendant of an extinguished species which used to live in Central Europe in ancient times. In Spain and Portugal, this original breed was transformed trough selection into the modern bullfighting bull, specifically created to be killed in the corridas. In the XVIII century ganaderías (cattle firms) consecrated to produce fierce aggressive bullfighting bulls are recorded to have existed in Spain. The main difference between a wild and a tame bull is their way to react when they feel to be menaced. The Spanish bullfighting bull will attack ceaselessly whoever or whatever moves in front of his eyes. 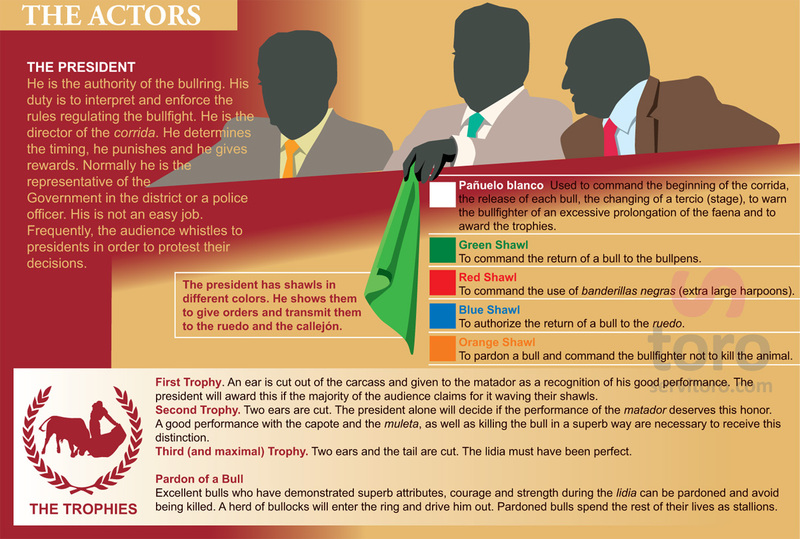 It is defined according to the appearance of the bull and his behavior during the fight. 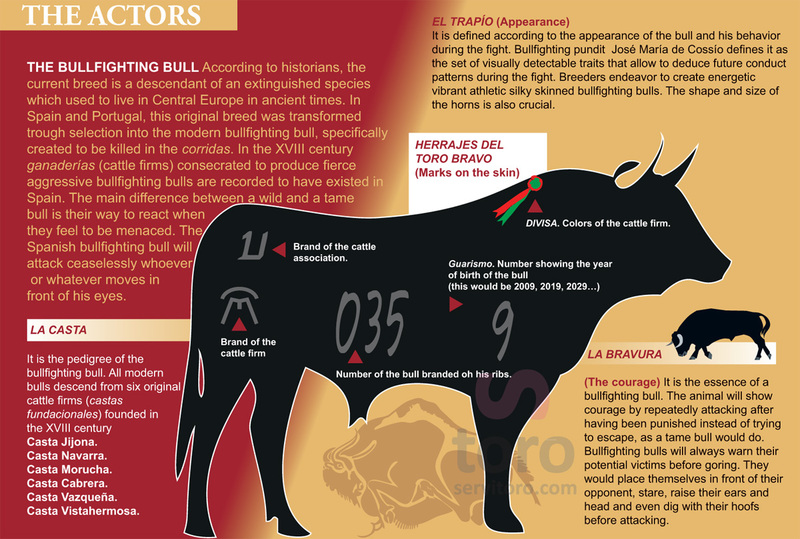 Bullfighting pundit José María de Cossío defines it as the set of visually detectable traits that allow to deduce future conduct patterns during the fight. Breeders endeavor to create energetic vibrant athletic silky skinned bullfighting bulls. The shape and size of the horns is also crucial. It is the essence of a bullfighting bull. The animal will show courage by repeatedly attacking after having been punished instead of trying to escape, as a tame bull would do. Bullfighting bulls will always warn their potential victims before goring. They would place themselves in front of their opponent, stare, raise their ears and head and even dig with their hoofs before attacking. Very often called also tercio de quites. At this stage the matador measures the strength of the bull, the way it gores and tries to detect the characteristics of each animal. Capote is the name of the cape used by the bullfighter to provoke the bull and dribble its attacks. It is normally held with both hands and used to carry on artistic manoeuvres, as well as conducting the bull to different places of the bullring. Is woven with heavy synthetic materials. Normally the side shown to the bull is fuchsia and the other yellow. In ancient times, capotes were manufactured in a wide variety of colors. It is common to dip capotes into starchy water to make them stiff. 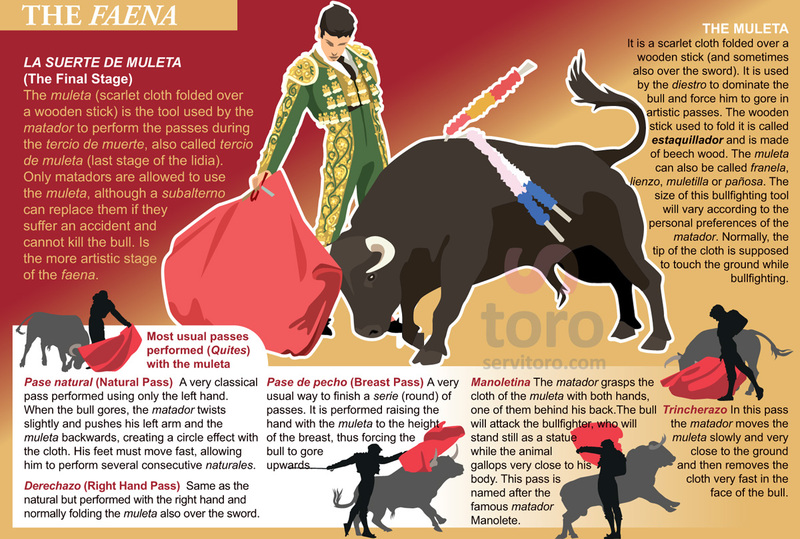 Verónica: The most common pass in bullfighting. When the bull attacks the bullfighter, he moves the cape to the right or to the left using both hands and steps forward with one of his legs to be prepared for the next pass. 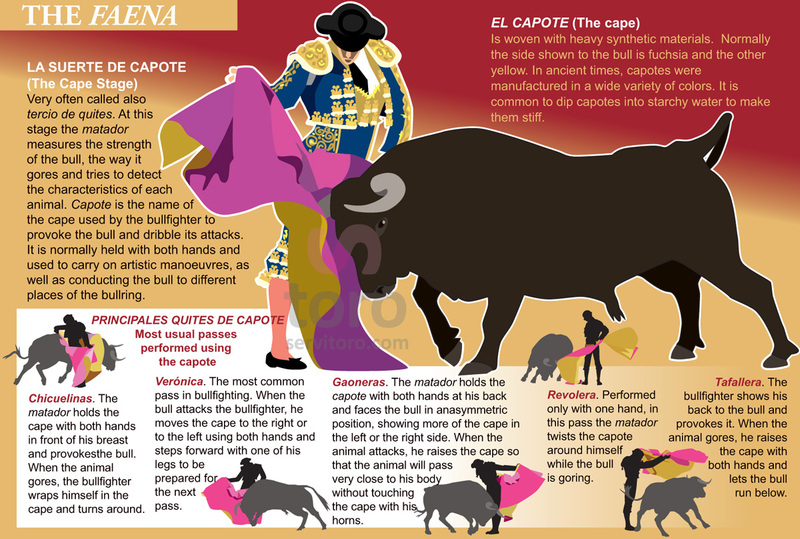 Gaoneras: The matador holds the capote with both hands at his back and faces the bull in an asymmetric position, showing more of the cape in the left or the right side. When the animal attacks, he raises the cape so that the animal will pass very close to his body without touching the cape with his horns. Tafallera: The bullfighter shows his back to the bull and provokes it. When the animal gores, he raises the cape with both hands and lets the bull run below. Tercio de varas (Stage of Pikes) Two are the goals of this stage of the lidia. First, testing the courage and strength of the bull. The picador identifies the brave or tame character of the animal, as well as his ability to get focused in his opponents and attack them repeatedly. 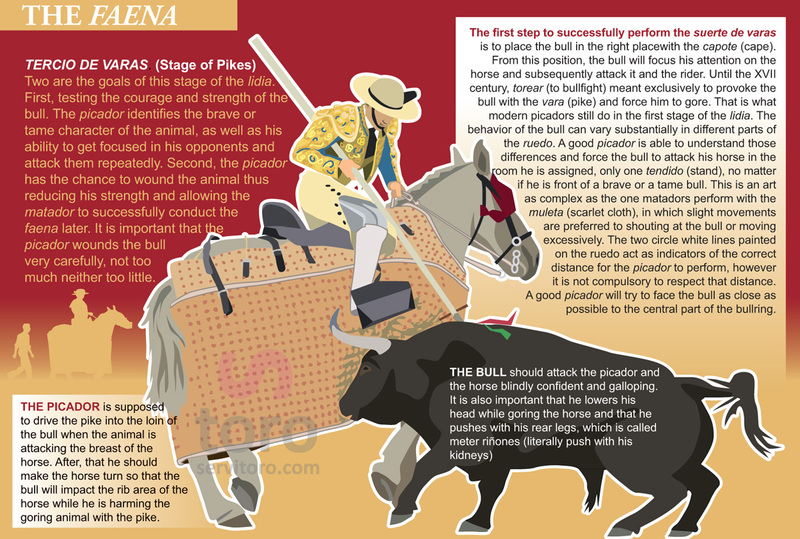 Second, the picador has the chance to wound the animal thus reducing his strength and allowing the matador to successfully conduct the faena later. It is important that the picador wounds the bull very carefully, not too much neither too little. The picador is supposed to drive the pike into the loin of the bull when the animal is attacking the breast of the horse. After, that he should make the horse turn so that the bull will impact the rib area of the horse while he is harming the goring animal with the pike. The first step to successfully perform the suerte de varas is to place the bull in the right place with the capote (cape). From this position, the bull will focus his attention on the horse and subsequently attack it and the rider. Until the XVII century, torear (to bullfight) meant exclusively to provoke the bull with the vara (pike) and force him to gore. That is what modern picadors still do in the first stage of the lidia. The behavior of the bull can vary substantially in different parts of the ruedo. A good picador is able to understand those differences and force the bull to attack his horse in the room he is assigned, only one tendido (stand), no matter if he is front of a brave or a tame bull. This is an art as complex as the one matadors perform with the muleta (scarlet cloth), in which slight movements are preferred to shouting at the bull or moving excessively. The two circle white lines painted on the ruedo act as indicators of the correct distance for the picador to perform, however it is not compulsory to respect that distance. A good picador will try to face the bull as close as possible to the central part of the bullring. It was a great invention by the founders of the art of bullfighting. The goal of this stage of the lidia is to ‘revive’ the bull, who normally tends to slow down after the tercio de varas. When the harpoons are driven into his loin, the courage and brave character of the bull will anger him and force him to gore again when he is provoked. This can be a very spectacular and risky performance, which requires talent, dexterity and agility from the bullfighters. This stage of the lidia implies a lot of movements and different techniques. The situation of both the bull and the bullfighter at the beginning of the cite (provocation) will give different names to the performance. 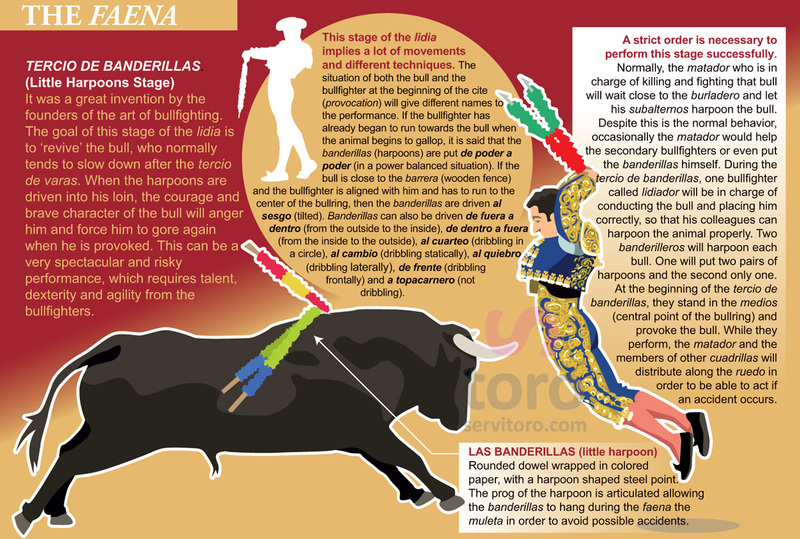 If the bullfighter has already began to run towards the bull when the animal begins to gallop, it is said that the banderillas (harpoons) are put de poder a poder (in a power balanced situation). If the bull is close to the barrera (wooden fence) and the bullfighter is aligned with him and has to run to the center of the bullring, then the banderillas are driven al sesgo (tilted). Banderillas can also be driven de fuera a dentro (from the outside to the inside), de dentro a fuera (from the inside to the outside), al cuarteo (dribbling in a circle), al cambio (dribbling statically), al quiebro (dribbling laterally), de frente (dribbling frontally) and a topacarnero (not dribbling). A strict order is necessary to perform this stage successfully. Normally, the matador who is in charge of killing and fighting that bull will wait close to the burladero and let his subalternos harpoon the bull. Despite this is the normal behavior, occasionally the matador would help the secondary bullfighters or even put the banderillas himself. 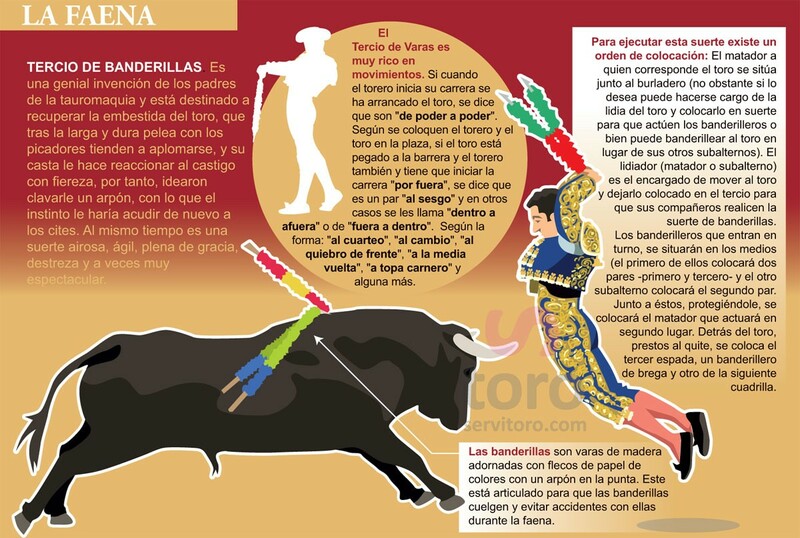 During the tercio de banderillas, one bullfighter called lidiador will be in charge of conducting the bull and placing him correctly, so that his colleagues can harpoon the animal properly. Two banderilleros will harpoon each bull. One will put two pairs of harpoons and the second only one. At the beginning of the tercio de banderillas, they stand in the medios (central point of the bullring) and provoke the bull. While they perform, the matador and the members of other cuadrillas will distribute along the ruedo in order to be able to act if an accident occurs. Rounded dowel wrapped in colored paper, with a harpoon shaped steel point. The prog of the harpoon is articulated allowing the banderillas to hang during the faena the muleta in order to avoid possible accidents. The muleta (scarlet cloth folded over a wooden stick) is the tool used by the matador to perform the passes during the tercio de muerte, also called tercio de muleta (last stage of the lidia). 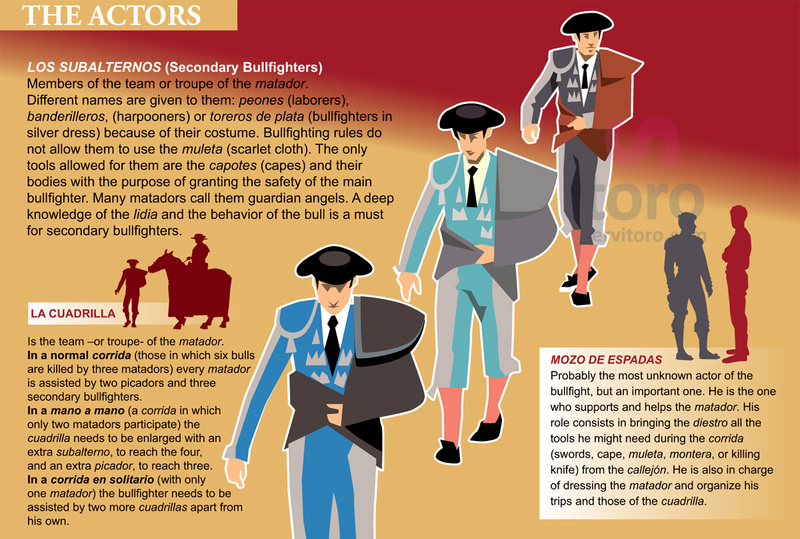 Only matadors are allowed to use the muleta, although a subalterno can replace them if they suffer an accident and cannot kill the bull. Is the more artistic stage of the faena. The muleta (literally the prop). It is a scarlet cloth folded over a wooden stick (and sometimes also over the sword). It is used by the diestro to dominate the bull and force him to gore in artistic passes. The wooden stick used to fold it is called estaquillador and is made of beech wood. The muleta can also be called franela, lienzo, muletilla or pañosa. The size of this bullfighting tool will vary according to the personal preferences of the matador. Normally, the tip of the cloth is supposed to touch the ground while bullfighting. - Pase de pecho (Breast Pass): A very usual way to finish a serie (round) of passes. 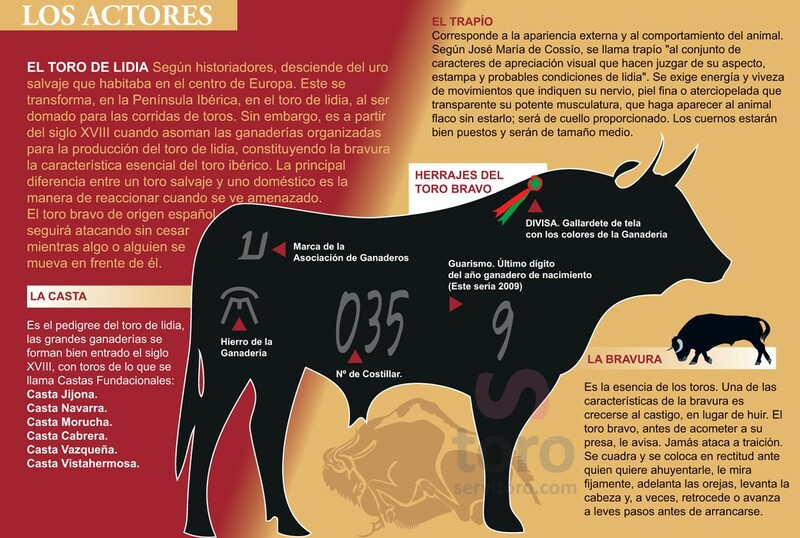 It is performed raising the hand with the muleta to the height of the breast, thus forcing the bull to gore upwards. 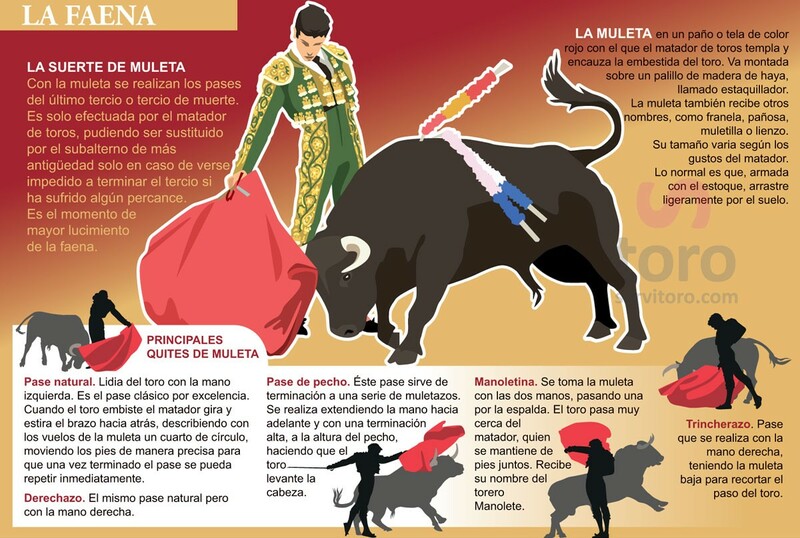 - Manoletina: The matador grasps the cloth of the muleta with both hands, one of them behind his back. The bull will attack the bullfighter, who will stand still as a statue while the animal gallops very close to his body. This pass is named after the famous matador Manolete. 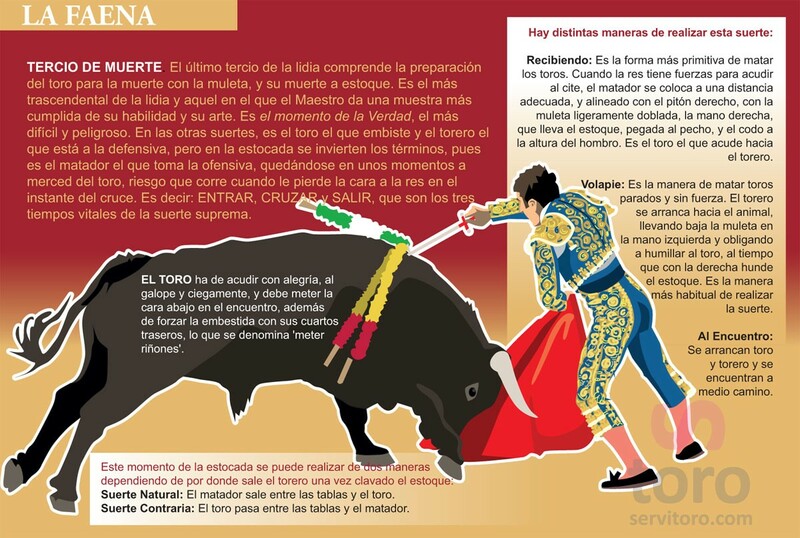 - Trincherazo: In this pass the matador moves the muleta slowly and very close to the ground and then removes the cloth very fast in the face of the bull. The aim of the last stage of the lidia (fight) is focused in preparing the bull to be killed using the estoque (sword). It is the most crucial time of the lidia and when the matador most evidently shows his skills. - Recibiendo (Receiving the bull). It is the most ancient way to kill a bull. It requires the animal to be still strong enough to gore in a speedy tenacious way. The matador will very carefully chose the right distance and position, aligned with the right pitón (horn) of the bull, the muleta slightly folded, his right hand with the sword close to his breast and the elbow as high as his shoulder. - Volapié (with flying feet): This way of killing the bull was invented to terminate animals lacking strength and unable to move fast enough. The matador will run to the bull holding the muleta in his left hand and the sword in the right. He would force the animal to lower his head with the cloth while, simultaneously, he stabs the sword into the animal. It the most common way to kill bulls. - Al encuentro (meeting each other): Both the bull and the matador run towards each other. When they meet, the matador stabs the sword.